hrough the fuel cell and emerged. 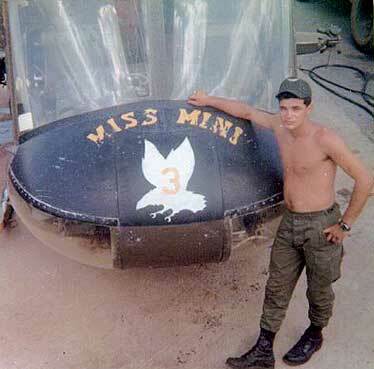 "Miss Mini" being rigged at Tan An for transport via CH-47 back to Bien Hoa. Joe Michalkiewicz standing in front. Note, there are no doors!! It would almost seem that the aircraft above, Bandit 3 "Miss Mini", is immortal! However, Bandit 3 is "reborn". 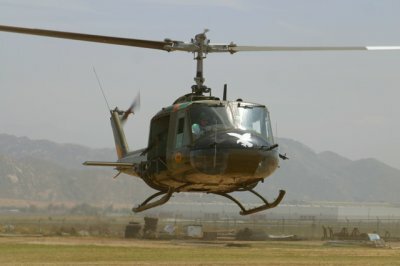 "Miss Mini", a UH-1C, 66-15193, did serve in the 118th AHC. 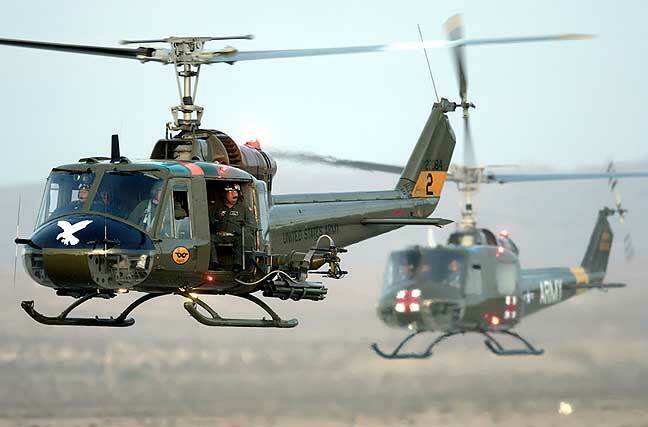 According to the Gold Book at AVSCOM, where a full history of most aircraft in the US Army is kept, 66-15193 entered the 118th with 877 hrs. 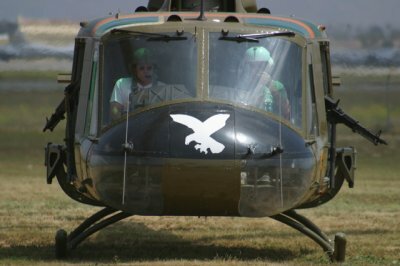 It served in the unit from Jan 69-Jun 70. What happened one day in June 70 is not known. 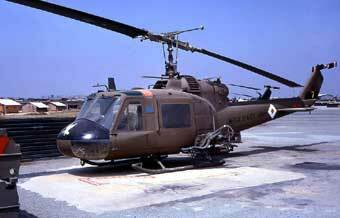 It was returned to Bell Helicopter for 5 months then back to RVN in Jan 71 to 116th AHC for 1 year. Then it went to the 120th AHC for 1972. Finally, it went to C Co. 16th Cav, then to Thailand and finally to the National Guard. 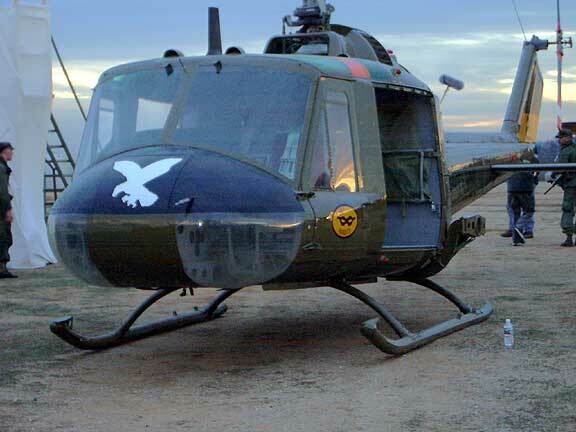 Quite a history for an old "war-horse"
Fred Eckelmann, a former crew-chief for the original Bandit 3 "Miss Mini", believes this is the actual bird he crewed when he was in the 118th AHC. 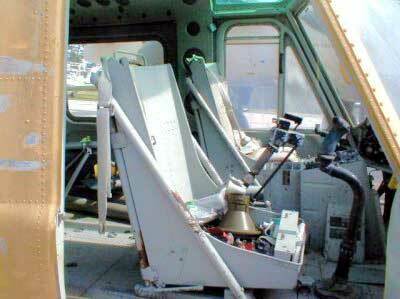 Fred, who works at the Tobyhanna Army Depot in Tobyhanna, PA, wanted to restore a UH-1C gun ship. He approached his boss, Frank W. Zardecki, and told him what he wanted to do and was given the go-ahead. 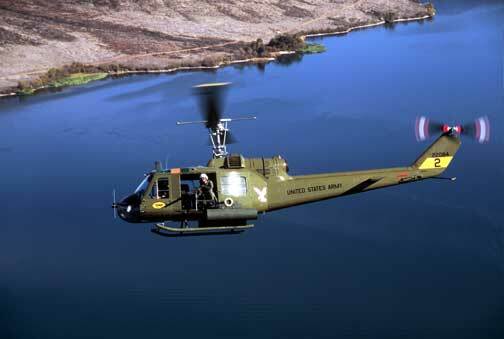 What you see above is the result...a carefully and accurately restored UH-1C gun ship. "Miss Mini" is trailered all over the N.E. area of the US to parades, fairs and air shows. Fred Ecklemann goes along and tells the story of the 118th AHC "Bandits"! If you would like to know more about Bandit 3 "Miss Mini" you can call Fred Eckelmann at 570-895-7264. Fred (who happened to have been the CE on Bandit 3 in 1968), handles the scheduling of the bird and just might be able to fit you in the schedule. 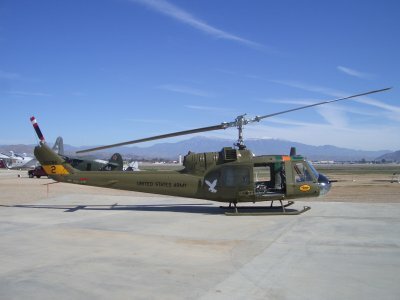 The Whittier Aviation Museum in Riverside, CA began an ambitious project in 2002-4 to find a rebuildable UH-1B. 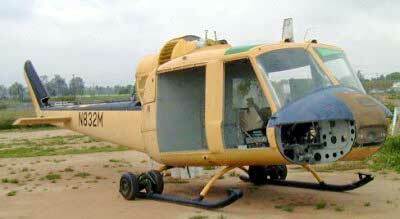 Apparently their objective was to re-build the aircraft and lease it to Hollywood movie, film and documentary makers. 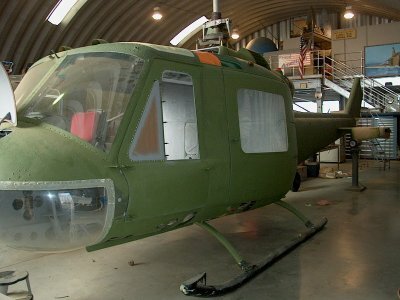 They finally came up with UH-1B, serial number 62-2084, and began the project. 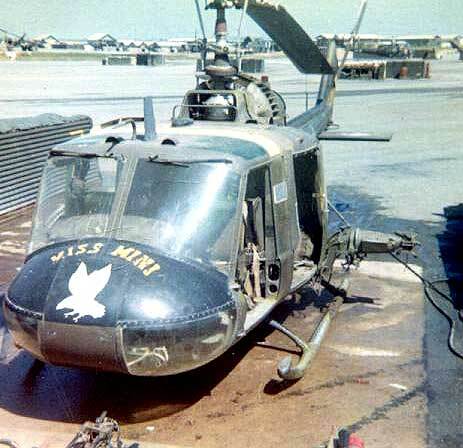 A check of the Gold Book Records showed that the aircraft was never in the 118th, but in the 101st Abn Div. in the U.S. and in Vietnam. 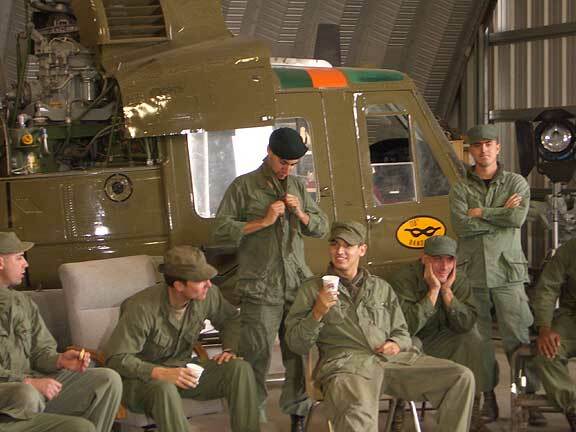 Pat Rodgers is a former US Army pilot(after Vietnam) and has been the project manager. 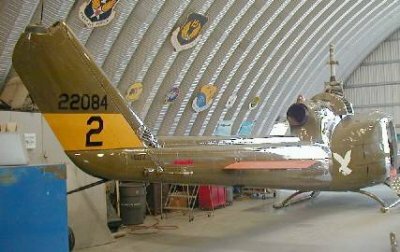 He contacted the Thunderbird web site Webmaster for assistance in insuring authenticity of logos and insignia prior to final painting of the aircraft. It was painted as closely as possible with 1963-64 insignia and logos as found in the 118th Bandits. Pat had studied the web site for some time and had a pretty good idea of what needed to be done. Bandit 2 being taped and primed prior to painting. 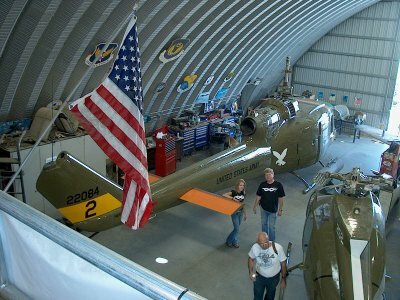 The hanger is a quonset type located at the March Air Reserve Base in Riverside, CA. 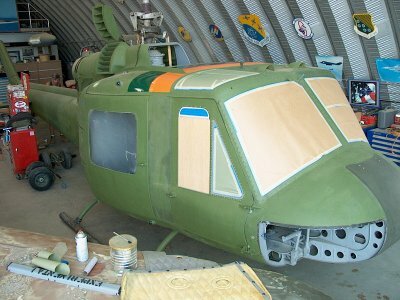 Another view from balcony showing taping and replacement of pilots "chin-bubble"
Finally painted with glossy OD paint typical of UH-1B's in 1963-64 time and with full color insignias and logos. Looking very nice. In the photo above, taken from the balcony in the quonset hanger, are Pat Rogers (r) and a part time apprentice mechanic, Roxanne Johnson (l), wearing black t-shirts with white "Bandit" masks they made for the day by sticking part of the masking from the vinyl stencil material! There have been 6 people working on the bird since April 2003. The aircraft was originally a stripped shell of a crop duster that has now been restored back to full military condition. 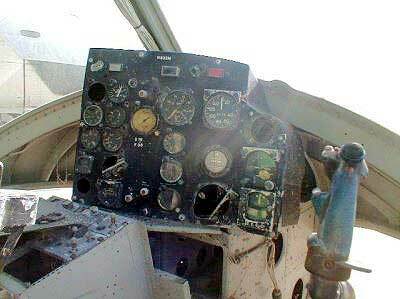 They replaced all wiring, hydraulics, instruments, blades, plexiglass, etc. to complete the job. 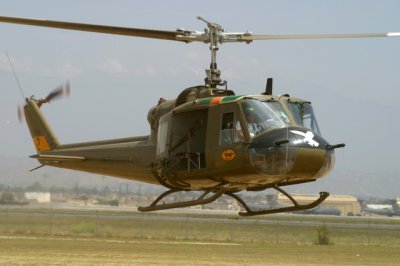 Interestingly, Pat said that he discovered a real Bandit UH-1C, 65-09506, aka Bandit 7, at China Lake Naval Weapons Test Center. 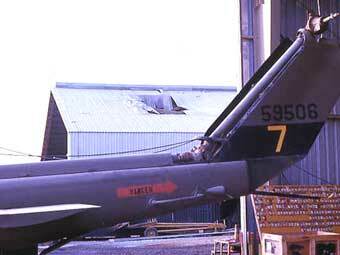 "She was used as a target for missile testing of some sort. I have not been allowed to take pictures on the range, but she's been shot-up pretty bad. I've got parts of her here at the museum, mostly stuff from the M5 gun system. There were a small number of bits and pieces that were serviceable and they have been installed on the Bandit B model, so part of her will fly again"! the "Special Opns" is about to take place. to air on the History Channel in 2004. Bandit 2 on a beautiful Riverside, CA day. March Air Reserve Base in Riverside, CA. the calander can be purchased. to raise funds for operation of the museum. 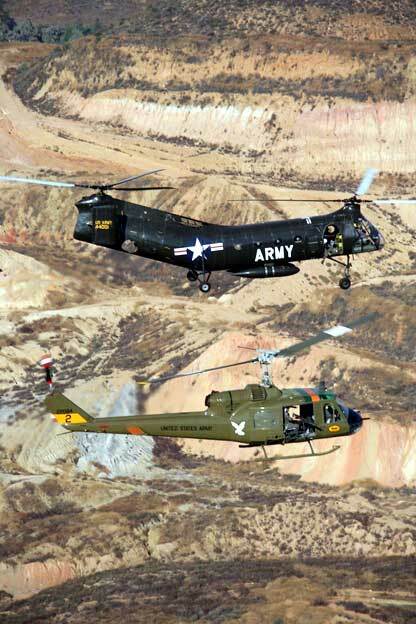 Two "Old War Horses" going home from an airshow in CA. Beautiful photo of Bandit 2 taken for the cover of "Pacific Flyer"
out of the photo, is Craig Cleary. Nov 10, 2007 for "Aviation Nation 2007" celebrating the 60th Anniversary of the USAF. and Shayne Meder not in picture as crewchief. China Lake Naval Weapons Test Center. 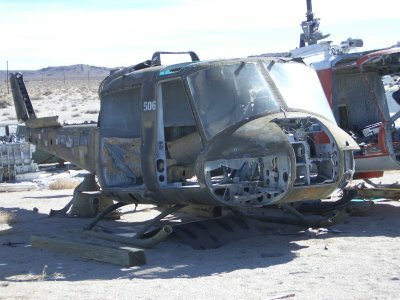 A UH-1C , aka Bandit 7, was recently found at China Lake Naval Weapons Test Center in very bad condition. She had been used as a target for missile testing of some sort and was nothing more than a "hollow hulk." She was shot up pretty bad. 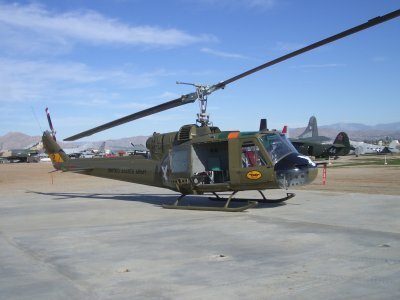 However, some parts of her are now at the Whittier Aviation Museum, Riverside, CA for safe keeping. The salvaged items are mostly stuff from the M5 gun system. 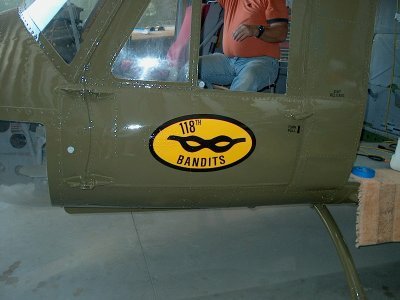 But, a few other bits and pieces that were serviceable have been installed on the restored UH-1B known as Bandit 2, above. So, a small part of old Bandit 7, will fly again! 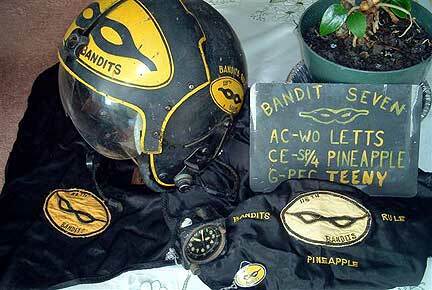 Above are personal items belonging to SP4 Roland G.
and in 1968-69 he flew as a Crew Chief on Bandit 7. (Photo courtesy Mel McKeague brother to "Pineapple"